Power market developments and changes to energy policy such as Germany’s coal phase out, the UK’s Carbon Price Floor (CPF) and changing renewable support schemes can drive revenues and costs, but they can change quickly. You’re expected to stay on top of each new development and advise on how to react to them. However, it can be difficult to monitor changes and assess the impact of developments in a rapidly moving market. ICIS makes sure that the latest events are put into context for your business by giving you access to detailed and clear impact analysis and price forecasting for European markets. Power Perspective and Power Horizon can be tailored depending on your needs and regions of interest. The power market solutions also give you direct access to our analysts via phone, email and messenger, so that you can discuss and clarify viewpoints, test assumptions, model details and particularities of power price forecasts. To find out more about the solutions or to arrange a free demo, please contact the team. We’ve been leading the way on carbon and gas markets for years, so we are very familiar with the needs of traders, analysts, investors and strategists when it comes to market data and analysis. 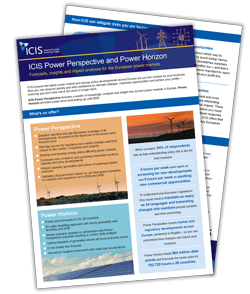 ICIS Power Perspective includes a wealth of knowledge, analysis and insight into current power markets in Europe. Power Horizon provides power price forecasting up until 2030. You can trust ICIS to deliver what decision-makers need – and you can speak to our experts any time. Our experts look at the news from an informed perspective, interpreting the meaning of change and understanding its impact. Regulatory change can have far-reaching consequences for your business. We combine our assessments and insight with robust long-term forecasts, so you can predict the potential positive or negative impact on your future bottom line. Consistent and comparable coverage of all European power markets using the same methodology and presented in English. This means that information can be evaluated and decisions made without additional processing. We understand you’re short of time and simply want to get straight to the point – which is exactly what we do. Choose ICIS for concise information and easy-to-assess formatting, all delivered straight to your inbox. Philipp is the director of the global Power & Carbon Analytics team. As head of European Power & Carbon Market analytics, Marcus provides qualitative and quantitative analysis in the rapidly changing energy markets in the EU. Stefan is a senior analyst in the Global Power & Carbon Analytics team at ICIS, and works across the qualitative and quantitative analyst teams to provide a holistic view of developments around the world. Matthew provides quantitative and qualitative analysis of a range of European power markets, with a focus on EU regulatory developments and the UK. Anise provides quantitative and qualitative analysis on European power markets for our power analytics solutions. Previously, Anise was a European gas and power analyst with S&P Global Platts and Eclipse Energy Group. Vija Pakalkaite specialises in the Nordic, Baltic and central-eastern European power markets and renewable energy regulatory frameworks, as well as renewable energy auctions across Europe. As the editor of the European Daily Electricity Markets (EDEM) report at ICIS, Irina oversees the editorial power team’s output across platforms. Irina is also an expert in the southeast European power markets. Ellie has a focus on central-east European power markets, typically writing news stories on the Polish, Czech and Slovak markets. Chris Somers is deputy news editor of the energy team at ICIS. He specialises in Nordic power, as well as the nascent Irish electricity market. Respond to change: No need to wait days or weeks for a consultant or lawyer’s view on legislative or regulatory changes. We report the key information, along with the impact, within hours. Focus on policy: Understanding the detail behind the policies that determine power market success or failure is what we do best. Our experts get to grips with the practical impact of evolving policies, which means that you can concentrate on the actions required to build profits. Providing context: We ensure that the latest policy developments across European power markets are put into context for your business. Use the insight for your advantage, respond quickly to changes and maximise opportunities to protect your profits. Expertise: Boost your capacity across the entire European power market-place and use the insights from our power market experts, to provide third-party analysis to back up your view. Earlier this year, a German coal commission was formed by the government and tasked to put forward a timeline for exiting coal generation. This ICIS analysis provides insight into the working principles of the commission and evaluates four coal phase-out scenarios with regards to their impact on capacity development and German power prices up to 2030. Will automation take over energy trade? This insight looks into reasons and ways to automate power and gas trade, the share of automated trade, its regulatory framework and future trends. Wholesale electricity prices are set to remain on the high side in most European markets this summer, but the risk of price spikes will be mitigated in several countries by better hydropower stocks compared to the previous year. This Power Summer Outlook Snapshot provides a brief overview of the drivers likely to influence power prices this summer, and an idea of what to expect in the coming months.